With four paved highways crisscrossing the nation, the coastal Caribbean country is easy to cover in an afternoon’s drive. Seated below the Yucatan Peninsula, Belize is neighbors with Mexico to the north, and wrapped by Guatemala to the south and west. Presenting only 8,800 sq. miles, the New-Jersey sized country presents a wide selection of activities between the lowland jungle, the mountains, and the coastal islands. The primary regions explored by Active Junky were the hilly jungles of the western border by Guatemala, the southern edge of the Barrier Reef on Glover’s Atoll, the northern edge of the Barrier Reef on Ambergris Caye, and an expatriates dream, island-town Caye Caulker. Through the course of our adventure, we found ample opportunities for cave exploration, hiking, biking, horseback riding, paddling, snorkeling and diving. B E L I Z E from Tommy Joyce on Vimeo. The inland towns of San Ignacio and Belmopan have become the go-to launchpad for many rainforest adventures. With opportunities for horseback riding, mountain biking, flying down a zipline, splashing through trails on an ATV, exploring the depths of the region’s largest cave system, floating down lush waterways on canoe, kayak, and SUP, the jungle is a can’t-miss aspect of this small country. Swimming in an underground cave during Ian Anderson's Jungle Overnight. Candlelight dinner at the mouth of the cave. The view from our hammocks during our overnight. Lightpainting the caves after the sun left us in darkness. Exploring the depths with our Cave's Branch guide. An inverted rappel affords a spectaular view! Back at the resort, fresh made parmesan ages in their artisanal cheese house, preparing for the daily tasting. The resort is perfectly situated on the river, which affords spectacular views of the Milky Way. If you’re interested in a serious outdoor escape, the adventure-gurus at Ian Anderson’s Caves Branch Resort are ready to spend the night in a jungle sinkhole. The pool at Chaa Creek. Refreshing every time. You can find Fry Jacks everywhere in Belize, but Chaa Creek's are something special. The spa is a short walk through the jungle. You'll find the butterfly garden right next door. Want to take a tour of the property? Head out on mountain bike or horseback. Looking for a little more privacy? Arrange for a secluded poolside dinner. For the best balance of amenities and luxury, Chaa Creek Resort is the unquestionable high standard in San Ignacio. Their staff goes above and beyond to make your stay memorable, and the range of activities available right on the property kept us entertained all week. The second largest Barrier Reef in the world stretches from Mexico to Honduras creating a vast ecosystem above and below the surface around the 700+ Belizean islands. Belize is an ideal destination for divers and snorkelers alike with thousands of species calling the region home. The Barrier Reef presents the added bonus of shielding a grand volume of Caribbean Sea from external wave-action, allowing for wonderful explorations on both kayak and stand-up paddleboard. The two main islands for tourism are Caye Caulker and Amergris Caye and each have a disctinct vibe. If you're truly looking to slow down, Caye Caulker's motto is 'Go Slow'. 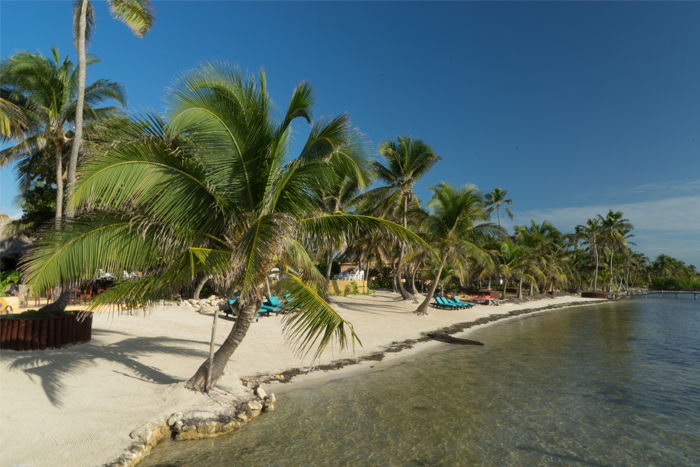 For a more lively scene in town and luxury accomodations, we recommend Ambergris Caye. Looking across Weezie's Hotel at sunset. Despite being situated just a few minutes from Caye Caulker's main street, you feel like you're forever away. The accomodations are modern, clean and ready for cooking! We were lucky enought to have a Supermoon rise while we were there, so we went paddleboarding! While on Caye Caulker, have some breakfast at Amor y Café, and if you choose to stay the night, Weezie’s Island Resort offers a variety of room options, including cottages and suites. The cabanas at Portofino Resort are breathtaking. Gorgeous down to every little detail. As you can imagine, the overwater hammock is extremely popular! Need some extra work? Let the massage staff take care of you. The main deck, bar and restaurant at Portofino. Happy Hour begins whenever you're ready. Private dinner on the beach? Yes please. A stroll under the moonlight in front of the resort. On Amergris Caye, head to Portofino Resort for expansive private cabanas and incredible beachfront activities. The staff is more than happy to whisk you to and from town on one of their resort boats for an afternoon of shopping and exploring. Renting bikes or golf carts is a great way to explore the island! With such a long traverse along the Caribbean coastline, the Barrier Reef can be accessed by many guide outfits eager to take your dollars and get you breathing their nitrox. However, with proximity to both the Blue Hole and the closest access to whale shark spawning waters, Isla Marisol Resort is the Active Junky go-to. A master diver with 6,000+ dives, an owner with an additional 5,000+ and an excitement for what lies beneath second to none, this guiding company should be your first choice when diving in Belize. Looking for an overwater bungalow to call your own? Isla Marisol can't be beat. The nights were stormy, which made for glowing sunrises. Feel free to swim out and catch rays on the 'water beds'. Mora and Eddie run the dive shop and will encourage you to schedule some scuba or snorkel time. Get a little exercise on their paddleboards or kayaks. Meals are served family style for the residents of a dozen secluded cabanas. The threat of rain each afternoon made for spectacular cloudy sunsets. Don't forget to peek outside your cabana late at night. When the hurricanes subside in November, the hillsides become dense with tropical forest and the skies clear to a beautiful blue reflected in the ocean. An already gorgeous country hits its sweet spot during the northern hemisphere’s winter. Unfortunately, every traveler looking at Central America knows this and wants to be there during the holiday season to escape the winter chill. Our recommendation? Roll the dice and go in the fall. Traveling to Belize in October - at what could be considered peak wet season - definitely presented a unique experience in seeing the country during its tourism off-season. While our selection of bars and restaurants were somewhat diminished, the rates on flights, lodging, activities, etc. were very affordable. In addition to this, the rain is truly not oppressive and planning for it was not a necessity. In our two weeks, we only caught a couple of showers and each ended within an hour. As a cultural hub for the Maya Society, there are over 600 ancient Mayan sites throughout Belize that each hover along the scale from “holy cow gotta see it!” to “neat! cool rocks.” Active Junky was able to explore Cahal Pech, Chaa Creek, Benque Viejo, and the Black Hole on the Property of Ian Anderson’s Caves Branch. Like many Central American Nations, Belizean cuisine revolves around stew, beans and rice. This is the primary local dish with protein coming from chicken and pork. The x-factor of Belize cooking is the tortillas. A unique take on the staple of many diets that combines characteristics of naan and crepes, the tortillas of Belize take your favorite Central American meals to an unprecedented tier. A burrito with refried beans, mango salsa, coconut rice, and any meat wrapped in one of these tortillas is one of the best in the world. We loved walking and found amazing food on the street from local vendors, so don't be afraid to say hello and ask them to customize one for you. Estel's By the Sea: Fry Jacks are a special breakfast treat not to be missed. Estel's By the Sea: Breakfast on the beach anyone? El Fogon: Their menu reflects the best of Belizean food. El Fogon: Wild Conch and Shrimp Ceviche appetizer. Happy Lobster: The king of ceviche on Caye Caulker. Happy Lobster: Everything is prepared right there on the island! Amor y Cafe: Cruising by in a golf cart in the late afternoon. Amor y Cafe: Can you say ham and pineapple breakfast sandwich? Rose's Grill & Bar: an open flame is best for fish according the the chef. Rose's Bar & Grill: Fresh lobster on an open flame. With rice and beans being a generally bland dish, there is fierce competition in the hot sauce market between Hot Mama’s and Marie Sharps. Active Junky became partial to the latter due to the Grapefruit Pulp Habanero and Mangonero offerings. It’s a must to try them all! Favorites on Caye Caulker: Breakfast at Amor y Cafe, afternoon ceviche and the local brew, Belikin at Happy Lobster, and dinner at Rose's Grill & Bar. Favorites on Ambergris Caye: Breakfast at Estels by the Sea, street food from locals for lunch, and dinner at El Fogon in town. Favorites in San Ignacio: Breakfast at Pop's right in town, lunch at the spectacular Guava Limb Cafe by Chaa Creek, and dinner at Cenaida's for the best local cuisine. The best reason to visit Belize is the national pride and unbridled friendliness of all its citizens. Everyone says hello to everyone, and people are genuinely happy to help you. The country is beautiful and diverse, and residents are eager to tell visitors all about the exciting opportunities that lie in Belize.